Obama was right, a change is coming. That change is expected to gradually overtake the Southwest in the next 20 years. Political strategists can foresee this change and are advising us to brace for it because it will change how we measure success from our current standard. These strategists are telling us that instead of keeping up with the Joneses, we will be keeping up with the Gonzalezes or the Rubios in the next 20 years, and that explosion is geared to happen in the Southwest. Currently, Latinos in the Republican Party are only 1/3 here in Texas, I admit. But not because we are not wanted, but rather because only a few of us have the ability to possess that confidence to say, no to the race baiting, and no to the empty promises that limit our potential. We become strong along the way from failure and the sheer determination that failure will not kill us, but will redefine us for success. That success, then, is determined by our ability and our decisions made at a very early age that started by education. Democrats would like you to believe, especially all those Young Latino Texans wanting to attend college, that your limits are set by how many government grants there are out there. But when I listen to the story of Marco Rubio and his plan to get educated, he understood what he had to do to achieve success. His parents left Cuba and he himself could not see returning to this country. He attended Tarkio College for one year on a football scholarship and then transferred to Santa Fe College before going onto law school. He had the drive. He had the opportunity, education, and now the success. Yet, when I listen to Latinos graduating high school in Texas, they dare not go further than the designated line written by their parents. I see lost opportunity for them and for us. As parents we want to protect, but over protecting can stagnate a seeking mind that will develop into a productive educated American; hence, a taxpayer. 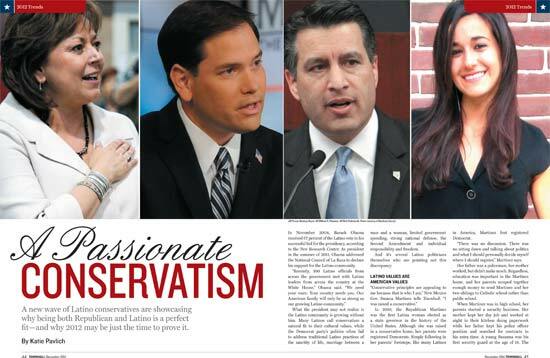 These individuals, whose Latino culture smothers them with loving protection, costs us a new Marco Rubio, Al Gonzalez, and even a Susanna Martinez. The conditioning for restricted success starts at home. When we tell our children not to go too far, Latinos begin to learn to restrict themselves from achievement; hence, this becomes the template for the failure that keeps them from breaking out into a new environment that could bring them success. Democrats too often favor government grants without asking for personal accountability. It is, therefore, this type of free grants that foments unresponsive citizens in the minds of young Latinos who may believe that government is responsible for personal choices. This constricted opportunity, provided by Democrats, is given to the students by way of Pell Grants and other Grants, with no sense of guidance and direction by the University administration or the counselors themselves on how to use those grants. For instance, “in 2002, the federal government disbursed an initial $15 million dollars for a variety of start-up grants to Hispanic colleges; then added another $70 million that went to rev up existing grant programs. Hispanic-serving colleges are those whose student bodies are at least one quarter Hispanic. These institutions are concentrated in California, Texas, Florida, Puerto Rico and New York and New Jersey.” This helped to increase the Latino student population into the vocational school and the medical field, but it did little to give students the responsibility of earning their success by way of achievement. Latinos were being given money not because of ability but because of the shortage found in institutions where there was little diversity. The result, was a sense of disinterest and high drop-out rate because students didn’t feel that they had “earned” their way into the institutions. They were given things that did not develop that sense of accomplishment. According to the Pew Hispanic Organization, “College-age Hispanics accounted for 1.8 million, or 15%, of the overall enrollment of 12.2 million young adults in two- or four-year colleges in 2010—setting records both for their number and share of young college students.” But the trend does not follow through because many Latinos drop out before completing their education. What is happening to stagnate that success? Again, students lose their drive because they do not have to compete for their accomplishment. They are blindly given that opportunity that makes them to feel less deserving of that success. In Texas, the Top Ten Percent Program allows Latinos, who graduate in the top ten percent of their class, admission in the State schools. As is stated in previous articles, this will create a new tier of taxpayers and an educated Latino group. These young Latinos are well on their way to a successful career. However, their opportunity may be absolved and their potential can be stifled should they decide to study something that they find easy. Rather, than being challenged with an opportunity that will provide them with a job, especially in this competing and volatile market. These days we see students graduating without a job offer and with a large educational debt. Those who in 2008 saw a potential for a prosperous career, are now caught in the worst deficit curtailing of job opportunities since the last depression, according to many economists. The ambitious individual is driven by the realization that their success was earned. Every failure that turned into success, every grade on that mid-term paper; every job after an interview and every pay stub that shows the salary earned, creates that individual who is a confident and interactive voter/taxpayer. That individual will in turn begin to establish a vested interest in voting because he will acquire the capacity to buy a home and establish property rights. That educated and successful individual will then, find the ability to understand the basic concept of high taxation, and intrusive diminishing value of his 401K and contribution into the entitlement pot. And when educated Latinos acknowledge this value in themselves, they will realize their limits have been placed upon them by a conditioning rhetoric coming from the Democrats. Their education and success will be, to the Democrats, like Superman finding kryptonite and losing his strength. *pobrecito: Diminutive of pobre; poor thing; intended to give pity.